The wait is over -- it's time to reveal the winner to the giveaway. And the winner is.... Donna Louise Flanagan, who made the 10th comment, which was the one randomly selected by my beloved Excel ;) Congratulations, Donna! 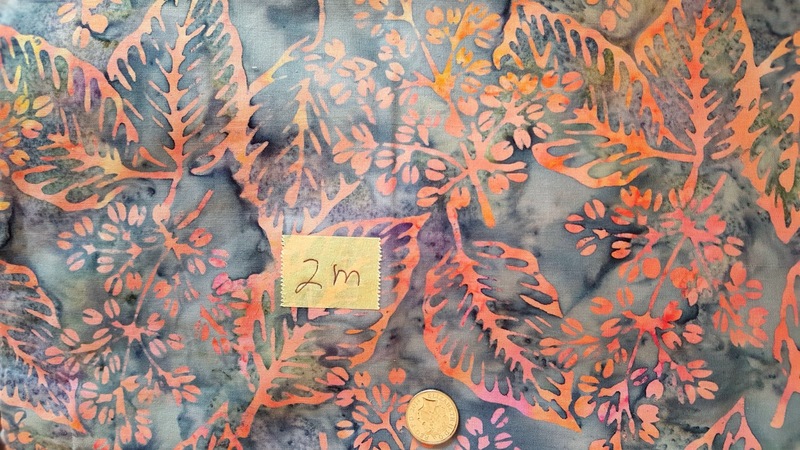 Please email your postal address to xinyuealice0803(at)gmail(dot)com and I'll get this lovely piece of batik sent over to you. Finally, thank you all for entering, and also for your very kind words welcoming back. Can you believe it? I've been doing a spot of selfless sewing! Most of you will know that I don't particularly enjoy sewing for anyone else but me. Selfish, I know! The only times that I did engage in selfless sewing were for special occasions. Remember the matching bolero, the favours, and the baby blankets (1, 2, and there was actually one more)? Yep, it either had to be a wedding or birth to get me to sew for someone else. There was one exception. 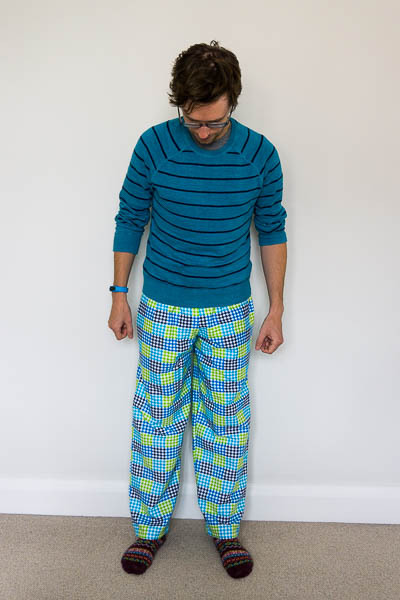 I also made a pair of flannel PJ bottoms for my hubby for our 2nd wedding anniversary (the gift was "cotton"), back in summer 2013. 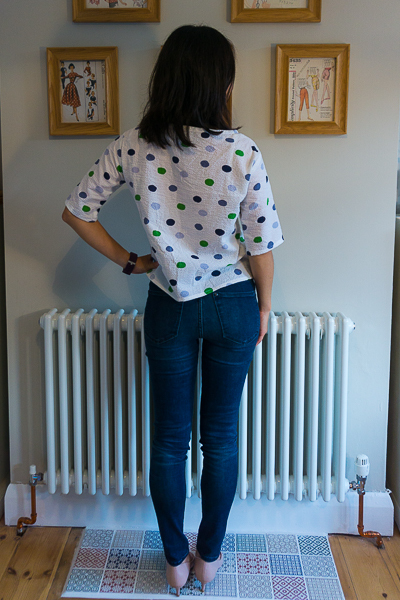 They were made with a lovely and soft cotton flannel, based on New Look 6764, and hubby wore them at home all the time, to the extent that some of the seams were slipping (!). TMI, sorry! However, when we were in Hong Kong & Bali this time last year, hubby left those PJ bottoms in one of the hotels by mistake! He would like me to add that he was feeling rather unwell for a couple of days, and it was in a hazy state that this had happened. Since then, those PJs were terribly missed by us both. 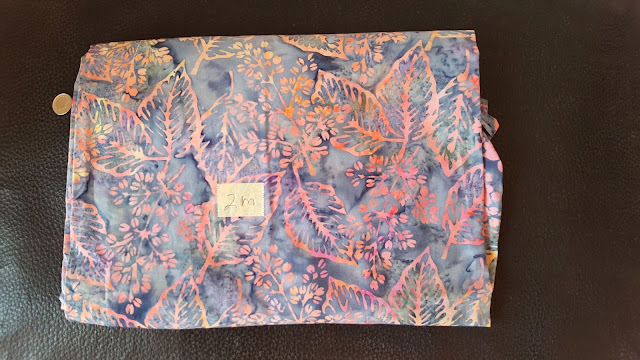 Thankfully, I knew that I had initially bought too much of that fabric, so I desperately hoped that there was enough leftover from making the last pair so that I could knock up another as a surprise. As soon as I got my sewing room back, I dug out the flannel from my stash, and started measuring. 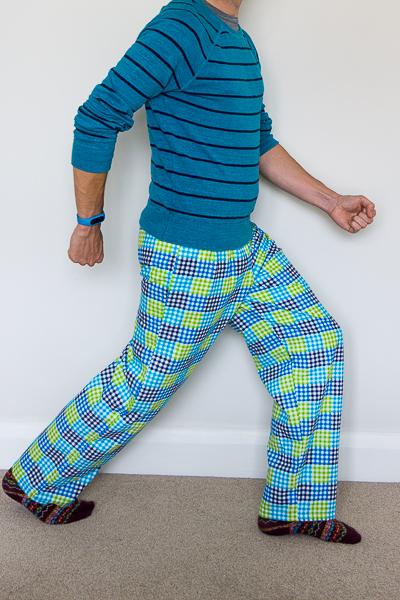 Luckily, I just about had enough to make another pair, as long as I was not overly fussy with the pattern matching. I used a different pattern this time, due to some struggles with the fit with the last version. 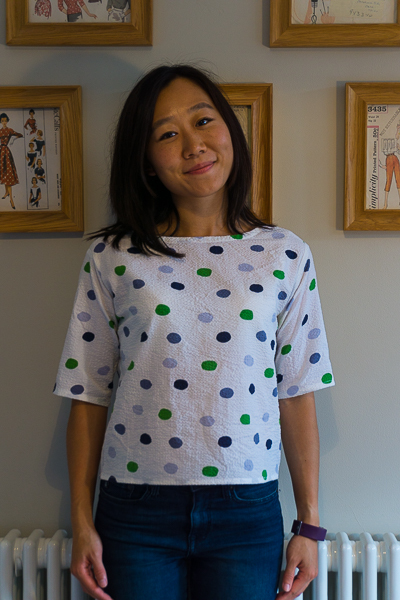 I chose Simplicity 1605, and cut a small. 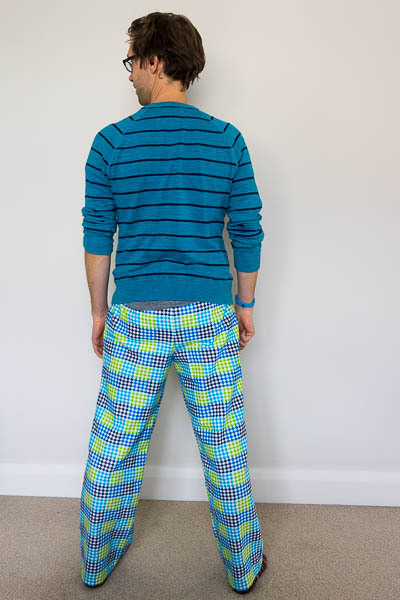 I have to admit, I much preferred the style with the Simplicity pattern, as it was much more relaxed, and in my view better serves the purpose of PJ bottoms/lounging around. In fact, the legs were so roomy that hubby asked me to take them in by half an inch from the bottom to just below the hips. 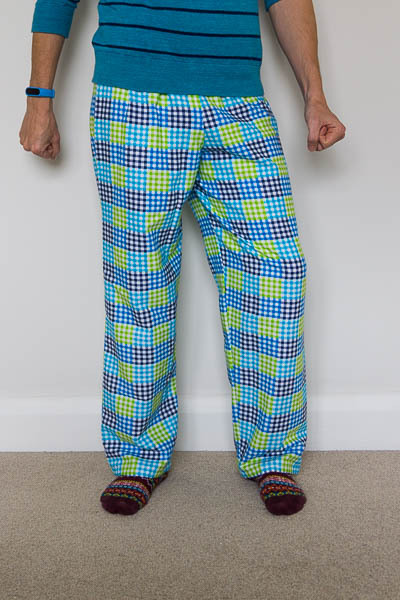 In terms of the construction, these PJ bottoms were really straightforward to put together. The only thing I noted was that the pattern instructions ask for the crotch seams to be sewn before the in seams, whereas I know that I prefer to sew up the leg seams, before doing the inside out leg in other leg trick to sew up the crotch seams. Know what I mean? We are both really happy with the finished product, and it was lovely to see the surprise on hubby's face! That was almost enough for me to engage in more selfless sewing... almost! How about you? Do you prefer selfish sewing, or find sewing for others more rewarding? 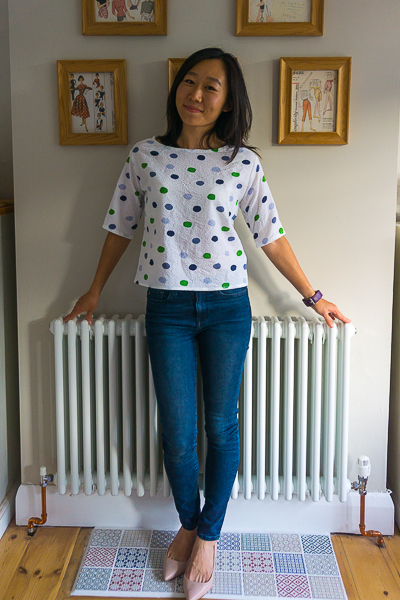 It's a little cropped boxy top, Simplicity 1366. It's not only fabulous, but incredibly easy to put together. It has no darts, or closures, and the sleeves are sewn flat, rather than set in (setting sleeves is a little pet hate of mine). Need I say more? The only thing that I did slightly differently in terms of construction was the neckline finish. As usual, I made self fabric bias binding and used that as a facing. The fabric is a beautiful piece of vintage seersucker that I picked up from our trip back to Cardiff (where hubby and I first met all those years ago) last summer. It was an absolute dream to work with, and super comfortable to wear. Guys, I can't believe it's been almost a whole year since I last wrote on this little blog of mine. Where has the time gone?! What's new with you? The main reason for my absence has been quite simple. It sounds like a cliche, but I struggled to find the time and space to sew. Let me explain. We've done quite a bit of work on the house since I last posted, and after the last 3.5 years of hard work, it is starting to feel more like ours. It does mean, though, that whenever a room needs refurbishing/renovating/ripping-out and starting over, my lovely girl cave becomes the storage room, or during the most recent project, our bedroom. After a few big projects, followed by quite a lot of clearing up, I've finally reclaimed my sewing room, and it is time that I get back to sewing. Oh how I have missed sewing, and my little blog, which, coincidentally, has turned 6 this Friday! 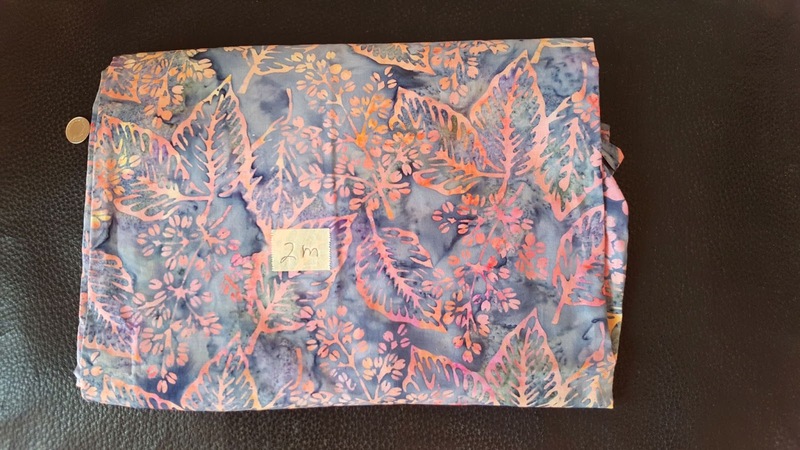 I'm partly reassured, however, that upon return, a) I still seem to know my way around my sewing machine(s), and b) whilst vlogs and instagram have transformed blog-sphere, there still appears to be people blogging, and reading blogs. Now, what better way to return than with a giveaway? To enter, simply leave a comment before midnight (BST) Friday 22 September, and the winner will be picked out of a hat. Before I go, I wanted to share my sewing to-do list with you. 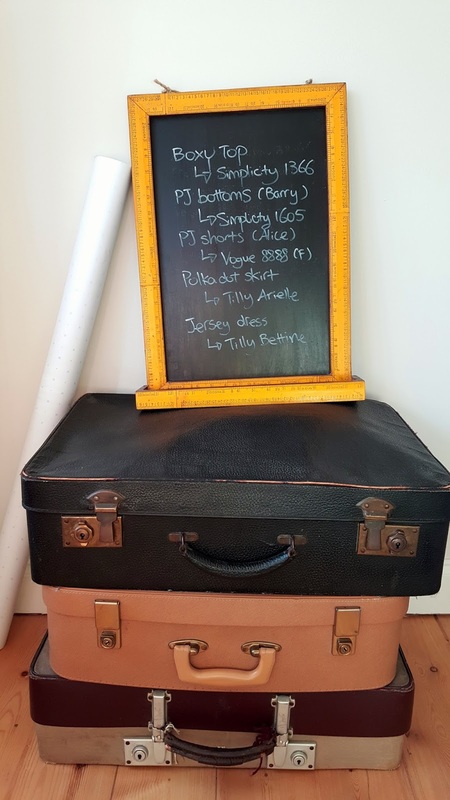 Remember my sewing blackboard? Most of these are pretty simple yet effective, so should be perfect for easing me back into sewing, before trying out more ambitious projects (like sewing activewear and more undergarments, which I really want to do). What's more? They are stash busting, which is much needed. Aaah I must admit, it is great to be back. I can't wait to share my completed projects with you very soon.